Zynga's decision to pull the plug on its Street Racing social game has blown up in its face, as the company has managed to simultaneously anger, insult and rip off its fan base in one fell swoop. The social gaming behemoth Zynga is best known for games like FarmVille, FrontierVille, Treasure Isle and Mafia Wars, but it actually has dozens of titles to its credit, including the aforementioned Street Racing. Street Racing's days are numbered, however, as the game is set to come down for good on August 2. But Zynga's unbelievably clumsy handling of the shutdown has fans up in arms. For one thing, nobody has any idea why the game is being killed. News of the closure came in a brief message posted on the Street Racing forum that said only, "Hey Street Racers - On August 2nd, 2010 Street Racing will be shutting its garage doors and will no longer be open for business. But if you liked Street Racing, try out FrontierVille by Zynga! Get out to the homestead for some fresh air and fun! See ya there partner!" Which of course leads to the second complaint: The stunningly condescending attitude that gamers who played Street Racer will naturally transition to FrontierVille just because Zynga tells them to. Social basis notwithstanding, could any two games have less to do with each other than Street Racing and FrontierVille? The final piece of the "screw you trifecta" comes from the fact that, just as in other Zynga games, a lot of Street Racer players sunk a lot of real money into the game to customize and upgrade their online wheels. That money will simply disappear once the game closes; Zynga's invitation to FrontierVille didn't include any offer to bring existing credits along for the ride. One possible reason for the Street Racing shutdown is its relatively small audience. It hovered around a half-million "monthly active users" for July (although its numbers are now dropping off), which sounds fairly impressive until they're compared to FrontierVille, which draws in almost 22 million MAU. Nonetheless, Zynga's approach to the closure was "fantastically stupid" and "asking for trouble," according to social gaming analyst Nicholas Lovell. "Telling people to try FrontierVille from Street Racing is telling people to play a game that is completely different in terms of concept and design. A hugely apologetic email would have made more sense," he said. "The second thing they could have done is offer people credits, where every [dollar] you spend in Street Racing will be used in other games," he added. "But I imagine they didn't want to set that precedent". UPDATE: Apparently Zynga is okay with setting that precedent after all. The company has released a statement that, while not exactly an apology, at least tosses a bone to unhappy Street Racing fans. 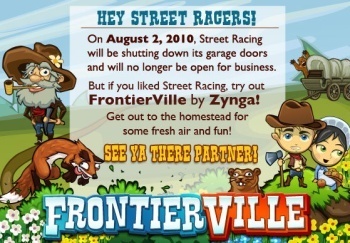 "As of Aug. 2, 2010 Zynga Street Racing will no longer be available. We had previously shared this news in forums, on the Street Racing home page, and also offered our recent paying players a credit for their purchases," the company said. "As an acknowledgment of the inconvenience these changes may have caused, we have offered credits to all players who have made a purchase in the last 90 days. Those players will receive a credit for the exact amount of their purchases, plus an additional 100 units of premium currency, in any of Zynga's nine most popular games. We thank the Street Racing community for their support and hope they enjoy a new Zynga game of their choosing." It's not clear whether this was the policy right from the start and just hadn't been clearly communicated (there's no indication on the Street Racing Facebook page that credit transfers are available) or if it's a reaction to the wave of negative feedback from gamers, but either way it sounds like a fair deal. It's just a pity it took so much screwing around and animosity to get here.